I am often asked is which are the best seats to choose on a flight, or in this case, what are the best Premium Economy or World Traveller Plus seats on the British Airways Boeing 787-9 Dreamliner? This is clearly a subjective question but after much time spent studying the seat plan of the British Airways Boeing 787-9 Dreamliner (see seat map below), I have concluded the best and worst seats on this Dreamliner. Please note the picture above is a stock photo of Premium Economy or World Traveller Plus on the British Airways A380 Airbus. I don’t expect the World Traveller Plus Class seats themselves to look very different on the 787-9 Dreamliner. I will confirm the look with my own pictures in a complete review of the British Airways Boeing 787-9 Dreamliner which I will be releasing after an exclusive Luxury Travel Diary press tour in November, around the time of the first passenger flight. There are just 39 Premium Economy seats on the British Airways Boeing 787-9 Dreamliner (less than the 42 in Club World). They are located directly behind the Business Class seats in an intimate cabin in front two toilets. The Premium Economy or World Traveller Plus cabin is set up in a 2-3-2 layout, so all the seats except the middle one in the centre of the plane and the window seats, have easy and direct access to the aisle. Access is a major issue for the middle or central seat on the aeroplane as the only way to reach the aisle is to climb over the passenger next to you. These seats are only advantageous if you travel in a family of 3 so you can all sit together. For an individual traveller these middle seats are a nightmare. It is worth noting that much of this cabin overlooks the wing, so if you like a window seat with a view it is actually worth selecting one towards the back of the World Traveller Plus cabin in rows 20 or 21 . What are the best Premium Economy or World Traveller Plus seats on the British Airways Boeing 787-9 Dreamliner? I think Seats 21A and 21K are the best Premium Economy or World Traveller Plus seats on the British Airways Boeing 787-9 Dreamliner if you like a view. These are at the back of the cabin but are the furthest from the wing so you will get the best view. 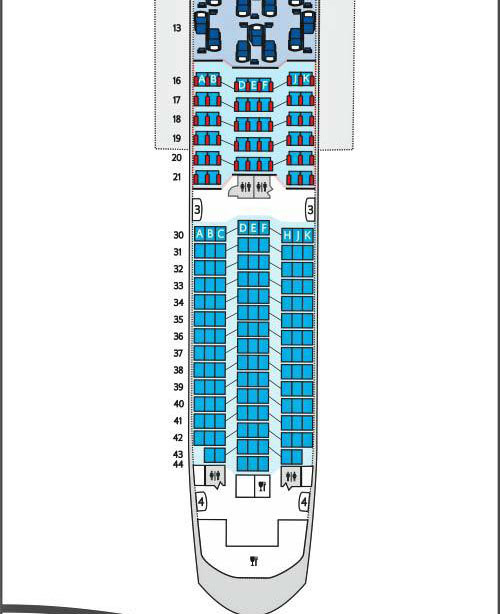 If you prefer the aisle seats, I would choose 16B and 16J because these seats are at the front of the cabin so furthest away from the toilets so you will have less passing traffic. What are the worst Premium Economy or World Traveller Plus seats on the British Airways Boeing 787-9 Dreamliner? As a lone traveller the middle seats are awful as you have no window and no access to the aisle. I would also avoid aisle seats in row 21, particularly B21 and J21 as these seats are very open to the 2 adjacent toilet doors. Both are my least favourite seats in Premium Economy or World Traveller Plus on the British Airways Boeing 787-9 Dreamliner. If you enjoyed this review you may be interested in my top 10 best Premium Economy airlines in the world my other British Airways flight reviews, British Airways in First and my other British Airways Premium Economy fight reviews.